Suzie’s Family Friendly Organic Farm Offers Tours, Camps, U-Pick, and More! Organic Farm Offers Educational Tours, Camps, U-Pick, and More! 140 Acre Family Friendly Organic Farm! 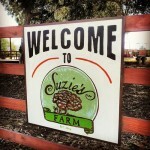 Suzie’s organic farm offers educational tours, camps, classes, U-Pick organic farm produce, and more! The kids and I visited the farm, which is located in the South Bay area of San Diego, on a media tour. The tour took us through the fields, and across much of their 140 acre organic farm. We loved every minute of it!